This week I am lucky enough to have a fellow Real Farmwife filling in for Hunk of Meat Monday. I bring you Sarah from This Farm Family’s Life. Be sure to check out her blog for other great recipes and learn a little bit about their farm and family. Hello Beyer Beware readers! Leah has allowed me to do a guest post for Hunk of Meat Monday so today I am sharing a delicious and super easy recipe with you. The husband and I, along with his parents, currently feed out about 150 head of beef cattle. We buy them as “feeder cattle” weighing about 500 pounds. Then we feed them until they reach about 1200 pounds and sell them as “fat cattle”. So, needless to say we are huge supporters of the meat industry. 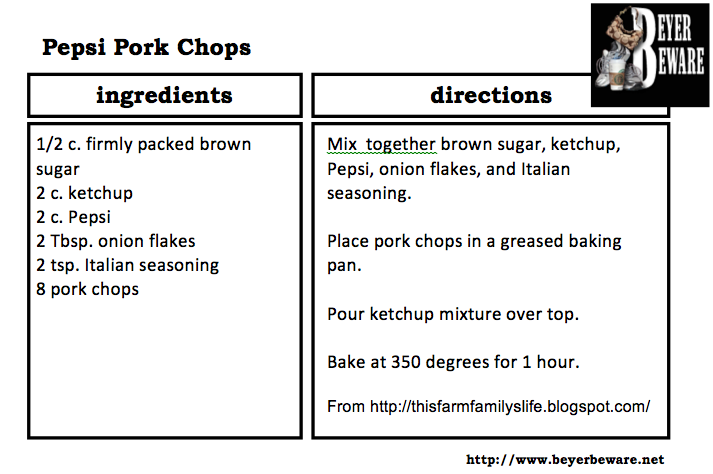 However, today I am sharing a pork recipe with you! I bring you my Pepsi Pork Chops! Start by combining the ketchup, Pepsi, onion flakes, and Italian seasoning. Place pork chops in a greased baking pan and pour the mixture over the top. Bake at 350 degrees for one hour. Enjoy! This recipe can easily be cut in half. I always make a lot to feed my family of carnivores! Do you have a go to meal to share with us this week? Last week, I love these two recipes and they also got the most hits from all the Beyer Beware readers. Be sure to check them out. Your Pork Chops looks so yummy! Thanks for hosting and have a wonderful week! Leah, I have share Baby Back Ribs. Thank you for hosting! These pork chops look delicious and so easy! Love that kind of recipe! The pork chops look so good. Going on my list to try soon. Today I bring Surprise Meat Loaf. Thanks for guest hosting. Have a great week. Yum – looks good and so simple!! I will have to try this soon! Thanks for hosting! I got on the stick and actually participated with a link up this week! Pepsi and pork chops, where do I sign up? Sounds wonderful. New follower from Lark's hop. Hello – I found my way to your blog tonight looking for dinner ideas for the troops that I cook for. The mac/cheese pictured with your Pepsi Pork Chops looks delicious. Is that recipe in your blog archives? Thank you!